We decided to try our hands at a bit of vegetable and herb gardening again this year after a several year hiatus. We just got a few things and put them in pots because I still haven’t settled on a ‘landscape design’ for the back yard. (There is the one in my dreams that includes a 3 season room/conservatory, a patio, a beautiful new fence and award winning plantings…) The last time I tried to raise a tomato plant I put it on the west side of the house and it got burnt and spindly and we managed to reap a single tomato from the poor thing before it became compost. I think that I’ve learned a bit since then. We’ll see if I have learned enough. 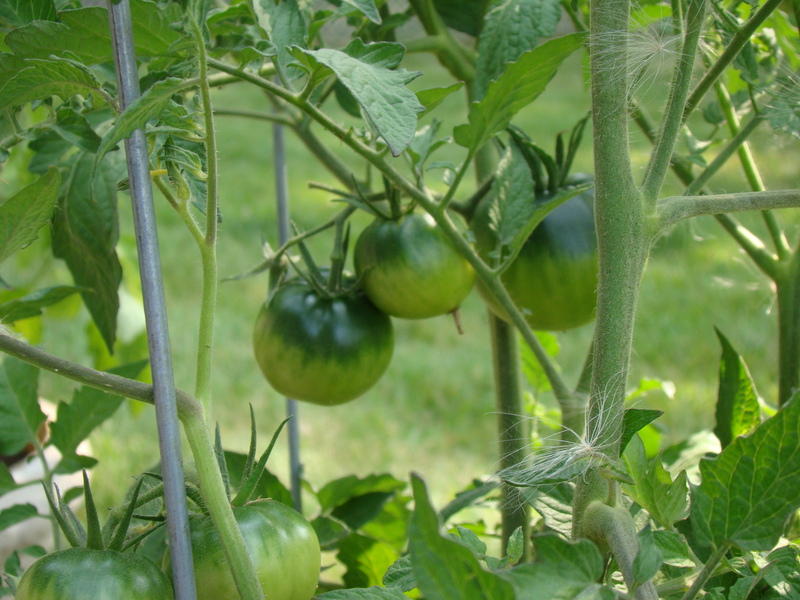 Now our tomato plants live on the south side of the house and are currently full of promise – about 18 tomatoes are developing between the two plants. We also have peppers, mint and oregano. We had basil, but a random wind burst blew a chair onto it and now it is in the process of dying. We are already realizing that the herb books we possess have gaps – like when and how to harvest. Perhaps the writer assumes we know this part… In which case he or she is wrong. I am enamored of the idea of gardening – decorative and produce. I have a stack of gardening books that I look at and reference periodically, some practical and some fanciful. Reading about our founding father’s deep interest in gardening, as gentlemen gardeners I realized that is around my level. I want to talk about it, think about it, enjoy it and just occasionally do the heavy parts. Plant something here, pull a weed there, rely upon thick layers of mulch to prevent weeds and help retain moisture. Unfortunately I don’t have the financial resources to pull off this sort of gardening. Watering is a Zen activity that falls happily in my version of gardening. Some days the plants have to wait patiently while I participate in other activities and interests, though. Gardening is perfectly suited to the acquisition of knowledge – it is forgiving of novice mistakes if you start slowly and allow for changes in plans. Gardening is helping me to practice the patience that I have mostly lacked in other parts and earlier stages of my life. You’ll have to excuse me now, I feel the need to go take a tour through the yard.